A United Launch Alliance Atlas 5 rocket is set for blastoff Friday carrying a sophisticated commercial imaging/surveillance satellite featuring a large telescope capable of resolving features on the ground just a bit larger than a football. Owned by DigitalGlobe, the WorldView-4 satellite will work with others in the company’s fleet to provide detailed, repeated coverage of global hot spots, natural disasters and other areas of interest to the U.S. government and allied agencies. “WorldView-4 is primarily targeted at our international defense and intelligence customers first and foremost, who are U.S. allies,” Jeffrey Tarr, DigitalGlobe’s CEO, told CBS News in a telephone interview. The Atlas 5 is scheduled for liftoff from Space Launch Complex 3 at Vandenberg Air Force Base, Calif., at 2:30 p.m. EDT (GMT-4; 11:30 a.m. local time), the opening of a 14-minute launch window. Forecasters are predicting an 80 percent chance of good weather. Flying away to the south over the Pacific Ocean, the Atlas 5 will boost the satellite into an eventual 383-mile-high orbit around Earth’s poles. Such polar orbits are favored by weather satellites, commercial imaging spacecraft and military spycraft because they are able to pass over every point on the globe as the world rotates below. Built by Lockheed Martin, WorldView-4 features a powerful camera system provided by Harris Corp. that includes a powerful telescope with a 3.6-foot-wide mirror. The camera will have a maximum resolution of just 11.8 inches, similar to the capabilities of DigitalGlobe’s WorldView-3, launched by an Atlas 5 in 2014. 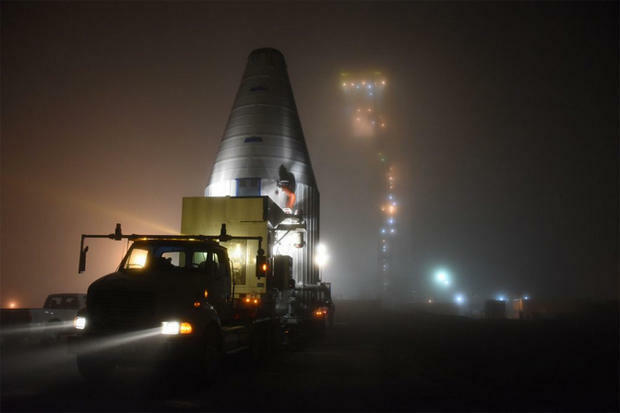 The WorldView-4 satellite, mounted inside a protective nose cone fairing, is hauled to a foggy Vandenberg Air Force Base, Calif., launch pad on Sept. 7 to await liftoff Friday. About the size of an SUV, WorldView-4 is capable of imaging 262,000 square miles per day, storing up to 3.2 terabytes of data on board for transmission to ground stations around the world. “It’s a huge amount of data,” Tarr said. “Moving the data around the globe is non trivial. We’re storing a lot of imagery on the satellites, we’re moving it down about every 22 minutes, because approximately every 22 minutes the satellite is over one of our ground stations somewhere in the world. Big. About the size of the Chevy Suburban, excluding the solar arrays. But why is it so big? The satellite’s telescope accounts for more than two thirds of its total size. While modern electronics have decreased the size and cost of satellite components like onboard processors, radios, and digital storage, there is no way to reduce the size of the telescope without degrading the resolution of its images, simply due to the laws of physics. WorldView-4 was originally built for GeoEye Inc., which had planned to launch it in 2014. But after the merger of GeoEye and DigitalGlobe in 2013, the fully assembled, tested and renamed satellite was put into storage. Tarr said increasing demand, prompted in part by the easing of government restrictions on commercial space imagery resolution, prompted a decision to get WorldView-4 into orbit as soon as possible. The earth’s surface area is roughly 510 million square kilometers. The DigitalGlobe constellation can collect 4 million square kilometers every day, which means that it could theoretically image the earth’s entire surface in about four months. But how much of that area is of interest to customers? First, let’s rule out the largely empty oceans and seas, which cover 71% of the surface of the earth, and also Antarctica (interesting for penguins but not so much for people), leaving about 150 million square kilometers of land. Next, let’s exclude the 60% or so of earth’s landmass that is covered by clouds on any given day. Now we’re down to about 60 million square kilometers of cloud-free, observable land area. If we consider that 95% of the world’s population lives on just 10% of the earth’s landmass, then we can infer that a great proportion of the most interesting activities on earth are actually taking place on a tiny sliver of its surface. WorldView-4 has an expected lifetime of about 10 years. Tarr said DigitalGlobe is in the early phases of designing a next-generation system that will enable much more rapid revisits to areas of interest. In 2015, Defense and security company Saab and DigitalGlobe Inc., a leading global provider of high-resolution earth imagery solutions, launch the joint venture – Vricon Inc. – to produce photo-realistic 3D products and digital elevation models globally for enterprise and government geospatial markets with unmatched coverage and delivery timelines. “In our business, time can mean life or death for customers,” Tarr said.